The current agitation for the restoration of the Sovereign State of Biafra is very different from every other form that has been witnessed. Since 1967, when Biafra became independent without a single shot just like the sovereign State of Israel, many nations such as Britain and her allies, became displeased about the declaration and quickly organized its allies to perpetrate the aggressive war of attrition on the new nation – Biafra. Exactly what the Arab Leagues did to Israel in 1948. Today, the beneficiaries of one Nigeria proudly talk of that war of attrition and hold themselves aloof as the "victors" in the war, but they never take a lot of things into consideration. First, the war was not fought by Nigeria. It was the British and her allies that fought Biafra and not Nigeria. Secondly, they had earlier announced that the war will last less than three months when they must have captured the Biafrans bare-handedly. They knew Biafra is a nation born anew and had no weapons to fight with, so they chose to fight us. As Ojukwu would often say, "we went to the war not to win but to defend our selves." Read also:TO THE LAISSEZ-FAIRE BIAFRANS....HOW MUCH IS YOUR FUTURE WORTH? Nigeria with her most sophisticated allies fought a new nation that had less than three thousand trained armies for a period of thirty months contrary to their earlier announcement of quelling Biafra in less than three months. It was an unexpected outcome. Biafra was able to withstand the fire power from the evil, blood-sucking British Empire who takes joy in conspiring to destroy other nations. British Government’s involvement in the war crimes committed against Biafra is on record and can not be denied even though the British Empire has tried its best to cover the atrocities before the international community. We still remember the ABA General Hospital bombing where more than five thousand civilians were killed by the British air raid. The survivors and offsprings of that horrible incident are still repulsive of Britain. It baffles most religious scholars how Britain through her Church Missionary Societies (CMS), now the Anglican community, brought their Bible and religion to Biafra, but turned around to support the Islamic Emirates to bomb and kill the Biafrans. It was in a bid to provide answers to the British enigmatic behaviour, that we stumbled on the revelation of one of the most fraudulent games that was ever played by Britain in Nigeria. The British shopped for a man to become the Prime Minister long before the make shift elections that ushered in the administration. They found a man who was a Christian and lured him to convert to Islam in order to become the Prime Minister. He simply did and became the first Prime Minister of Nigeria. Not everybody knew this story because it was top secret, but what people are asking is why would Britain as a Christian country engage in such a fraud? "What then are the lessons that the Christian converts stand to learn from those who gave them the Bible? This is simply an indication that everything about the British Empire is fraud. It may surprise one to know that Britain had earlier backslidden in the Christian faith long before her colonial advent in Africa. This will tell us why Nigerian politicians are the way they are, because "like mother like daughter", they have to act like their creator – Britain. A snake will always reproduce something long. Yet with their heinous cover-ups, the lid became blown open after these years. 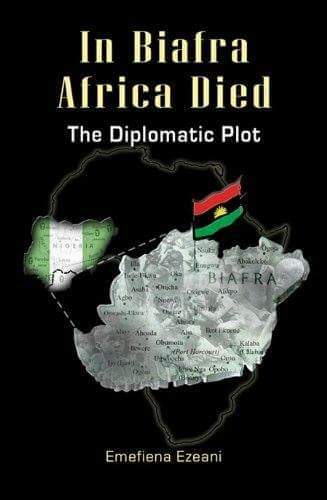 As Mr. Harold Smith would say, "Britain planned for every problem in Nigeria including the civil war..." After the starvation imposed on Biafra, causing the death of over 3 million people including children and women, we were again deceived into one Nigeria where they systematically targeted us for a final, silent and gradual extermination. Yakubu Gowon's refusal to implement the “3R" policy of Reconciliation, Reconstruction, and Reintegration even after causing the war by refusing to honour the Aburi agreement, speaks volume of the Nigerian Islamic agenda to completely decimate Biafrans. They further proved it beyond every reasonable doubt when the government gave every Biafran only twenty pounds irrespective of the amount of money he had in the bank. Things later degenerated after the years as no Biafran was ever allowed to become the president nor the vice. The Hausa and Yoruba oligarchy stealthily designed this heinous schemes among themselves as a continual compensation to the war criminals, whom they now honoured as "heroes." Since then, power has been between the north and west as they continued their schemes of subjugating Biafrans. The late Anthony Enahoro once in a national newspaper, lamented the horribleness of Nigeria’s divisive tendencies when he said, "this is not the Nigeria I fought to keep as one." Thank God the elder statesman foresaw this before his final exit. But there are still those who would see nothing wrong in Nigeria, they would prefer to remain in Nigeria, because it promotes their evil ways. Whether it is cheating, killing, intimidation, or any other kind of vile, as long as they’re beneficiaries of the recklessness, corruption and savagery. A country must not be run that way, there must be an everlasting solution to end Nigeria’s evil, and the ultimate solution is Biafra. There’s no better way to do it and hence in a bid to save the remnants of the genocidal war, the agitation for Biafra has gone to an unprecedented level that it is in today. That has been the best thing to happen to Africa. Today, everybody have seen the light and we have taken our future in our hands. It would never be the same again. Most Africans, including the politicians are watching the unfolding drama in Nigeria with their mouths wide open on how the so called "anti-corruption crusader" and his immediate family have been indicted in the most fraudulent and horrible bribery scandal. While Buhari is busy trying to conceal his fake certificate saga, his wife Aisha, is on the other side trying to maneuver her way out of her bribery scandal. What a family? What a ploy? What a people of savagery in the cloak of political change? Is this the much awaited change? They lie and cheat and then imprison those who raised their heads and voice to challenge their evils. The offensive odour of Nigeria’s festering wounds of atrocities, now scares most Africans who had previously been in illicit affairs with her. These compromising illicit, Africans should not forget that Nigeria's contagious sickness will eventually affect all those who messed around with her. Africa must be sanitized of corrupt politicians. The agitation for Biafra has taken an unprecedented dimension, that will never be imagined. It is an agitation for the emancipation and freedom from the shackles of vicious neocolonialism and the gruesome Islamic subjugation. Africa must be awakened to this prevailing reality, it must support the restoration of the sovereign state of Biafra, if it truly desires to take its pride of place. All lovers of truth, freedom and justice must stand up to join this moving train.